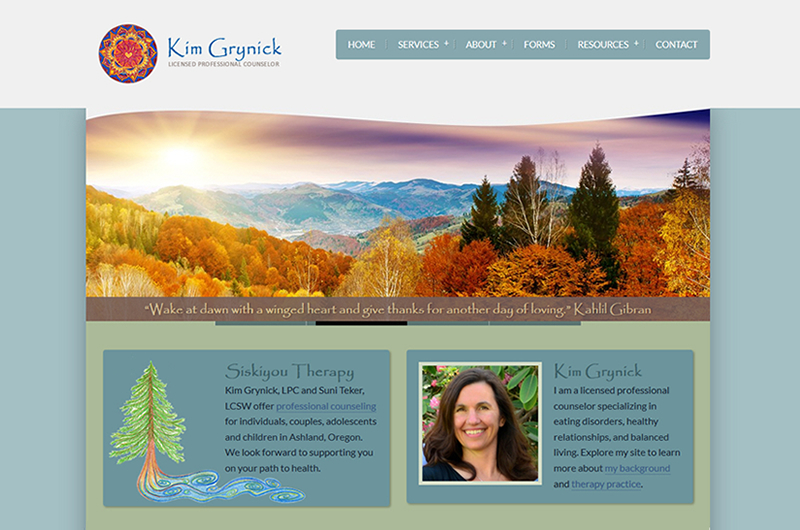 Kim Grynick is a licensed professional counselor in Ashland Oregon, who specializes in eating disorders, healthy relationships, and balanced living. Her site conveys her philosophy, background, as well as her strength and love of nature. Kim’s signature touch and ideas are evident throughout — the drawings, including her logo and the tree, are her own. And inspiring quotes can be found sprinkled throughout, such as those that accompany her four season slideshow images: “Wake at dawn with a winged heart and give thanks for another day of loving.” – Kahlil Gibran.